We catch up with Diné (Navajo) and African American model Kiara Nizhoni Jones. Diné (Navajo) and African American model Kiara Nizhoni Jones may seem the most modest (and sometimes quietest) person around; until you see her modeling portfolio. It’s her flowing poses paired with her captivating expressions that scream the loudest. Which isn’t surprising, considering she’s a highly-requested and sought-after model in the Southwest. We catch up with Jones about what she does besides modeling, how she represents both of her cultures beautifully and why participating in Arizona’s Face of Foothills Modeling Contest is important. Born and raised in Phoenix, Arizona. My clans are Tłááshchí’í nishłį́ (I am The Red Bottom) Naakai ŁIzhinii bashishchiin (Born for African American) Kiyaa’áanii dashicheii (Maternal Grandparents are The Towering House) Naakai ŁIzhinii dashinálí (Paternal Grandparents are African American) Ákót’éego diné asdzáán nishłį́ (In this way, I am a Navajo woman). What are you doing in your life currently, besides modeling? I am a college student in Glendale studying to become a dental hygienist. I’m also, a track and field athlete and high school state champion. Running has always been an important part of my life and I feel it describes me more as a person than anything else. It gave me discipline and determination to find what I wanted to do with my life. 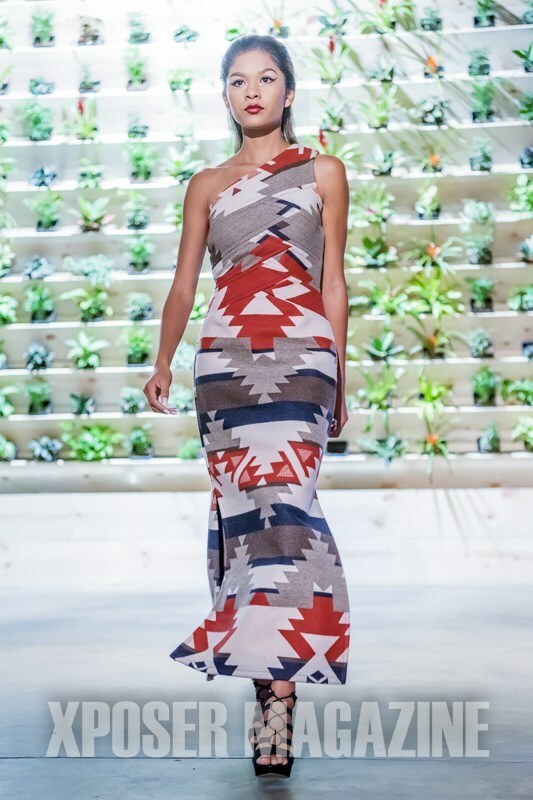 Jones modeling at the 4th annual Native Fashion in the City. You are a positive role model. What inspires you to be a role model? I was always pushed to do the right things growing up and I feel it really made an impact on who I grew up to be now. Growing up I’ve always known my younger family members were watching me and trying to do pretty much everything I did. With my younger brother, I wanted to be someone he could look up to. When did you become interested in fashion modeling? That was what triggered my modeling career. I wanted to show my family that anything was possible if they worked for it. I wanted my brother to know that if I can follow my dreams of becoming a model, then he too can do whatever he put his mind to. Modeling really opened up doors for me and I not only want to be a role model for my brother but for the Native American and African American community. As a mixed woman, what was your experience like coming from two different cultures? How do you represent and love both beautifully? I am half Navajo and half African American. My mother was born in Tuba City, Arizona, and my father was born in Omaha, Nebraska. Being raised in two different cultures was difficult. A majority of the things my mother did, my father didn’t understand or thought the opposite but I learned to combine both in a way I could understand myself. My mother is traditional and my father is Christian. There was some controversy on both sides of the family with my brother and I. We looked different than everyone and some looked down on us for not being just one culture. My brother was bullied and I was not but I tried to protect him as much as I could. I’ve learned to represent both sides whether people liked it or not. I am a mixed woman. I find that being mixed made me stronger. I was not only one culture but two combined. I have the knowledge and strength of my ancestors that built me up to the woman I am today. Jones modeling for ACONAV for Walt Disney World. How has modeling helped with that? Modeling mainly with Native American designers I’ve learned more about different Native American tribes and grew to love their cultures also. I hope to expand to African American designers in the near future to gain more cultural knowledge with them also. I want to motivate not only these communities but any mixed kid that they don’t have to be just one side but can be culturally diverse. Tell us about the modeling contest you’re currently participating in. Currently, I am participating in the 2019 Arizona’s Face of Foothills Modeling Contest. It is a great opportunity to get myself not only a modeling contract but to be in a magazine. This will widely expand my modeling career and I am very excited to have this opportunity to participate. Why is it important that a Native American and African American model like you participate in this contest? It is important to me as a mixed woman because there are not that many Native American models in the fashion industry. There has been a great controversy about Native designers not using Native models but many women and men don’t try out for fashion weeks or modeling industries or know that they can. I want to represent them and hopefully, start my own industry one day to encourage them to join the modeling industry no matter the shape or size. I hope to one day be an inspiration for my culture and to impact them in a way to change their futures for the better. Kiara Jones is featured as part of our Native Max Afro-Native series, a space on nativemax.com dedicated to the Black and Native narrative. Read more stories and information here. To submit your story, email us at nativemax(at)gmail.com.